I use Color Wheel Charts to reward each class for following my expectations for their behavior. When they fill their Color Wheel, they earn a Centers Day! 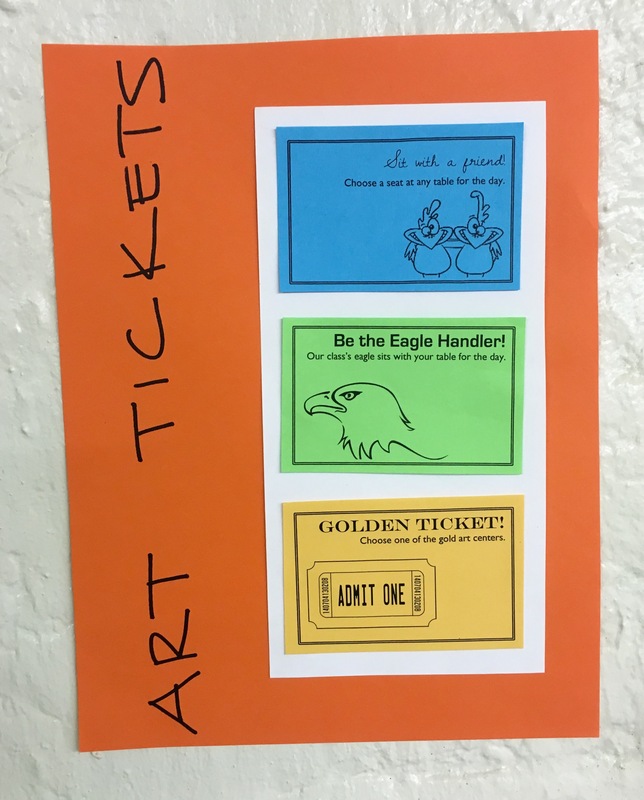 When I taught middle school, I used a system where students earned minutes towards their “Free Art Friday.” It was the perfect way to give them an incentive to get through transitions quickly and clean up quickly. I wanted to modify that same idea so that it would work with the rotation schedule I have at the Elementary School. I started by brainstorming what behaviors were the most important to keeping our Art Room running smoothly. In order to earn their color: they have to follow my expectations about volume, clean up quickly and line up quietly. I use our stoplight ART letters as a visual reminder of the volume level. If it is on green, it means our volume is right on target. I warn a class when they are getting too loud and let them know that if it doesn’t get quieter, I will have to take down the green “A”. They can earn the “A” back by changing their volume. My students really respond to the simple visual reminder of the “A” being taken down. I have a set of alarms on my computer that let each class know when it’s time to clean up and when it’s time for us to leave. After the first timer goes off, I give directions about what we need to do to clean. Depending on the project we are working on, they have 5-10 minutes to clean their table and go stand on their number for our Circle Up. During Circle Up, the Artist of the Day chooses people who are standing quietly to answer a creative thinking question. When our second alarm goes off, it means it is time for us to leave. Before they leave, I ask them to give me a thumbs up or a thumbs down as we talk through each of the three expectations they had to meet to earn their color. If they met them all, I pull out a color and put it onto their Color Wheel. If they missed one of the expectations, we review what they need to do to earn their color next time. After the first couple of rotations, I realized it was hard for me to keep track of how each individual class was doing. I decided to add the component of Extra Special Centers so that the classes that consistently earned their color would get an extra reward. 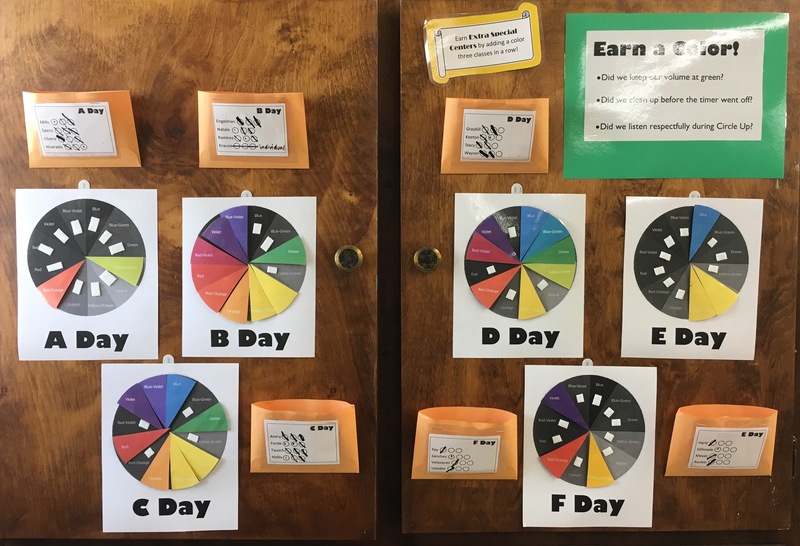 I created a chart that has three circles for each class and stapled it to the envelope that holds their colors. Every time they earn a color, I cross one of the circles off. If they earn a color three times in a row, when we have centers they get a couple of Extra Special Centers like paint, Playdoh or Legos. There were a handful of fourth grade classes that were having a difficult time earning a color. In those groups, most of the kids were on task and meeting the expectations. But there was a small group of kiddos who were struggling. I didn’t like the idea of everyone missing out on centers because of the choices a few kids were making. So I created a special “Individual Centers” seating chart. I explained that each kid would being earning their color individually. It is a lot of extra work! But I saw a big difference in the overall class’s behavior once they were each held accountable as individuals.